002 – The Woman in Red | All Eighties Movies. All The Time! 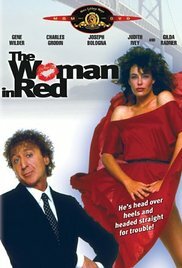 This week Gidgit and Angry catch up and remember the screen legend Gene Wilder in his 1984 film The Woman in Red. Also, Kelly LeBrock! This entry was posted in Podcasts and tagged comedy, romance, woman in red. Bookmark the permalink. Wonderful ‘Lady In Red’ podcast. I like the way the two hosts are enthusiastic and don’t mind going off the topic of the film in order to give the listener some interesting facts about the cast, the soundtrack, inspirations etc. Friendly, relaxed delivery with plenty of laughs keeps the listener engaged. Plus it’s pitched at the average person-not delivered in an elitist, contemporary critical theory manner! I’m surprised to learn that Stevie Wonders ‘I just called to say I love you’ was made specifically for the film soundtrack. Anyway I’m not writing a thesis- keep up the great work. I look forward to your next podcast. Thank you for this podcast. This movie was one of my favorite 80s comedies as a big fan of Gene Wilder and Kelly LeBrock. Consider me new fan from LA! Love the Ausie accents too. A lot less chaotic than many 80s podcasts I listen to. Born in 1972 80s movies are my passion. Heard you are doing The Burbs and cannot wait. Another of my favourite comedies from the 80s. ‘Gday and thanks’ Angry and Gidget. Hi John, thanks for taking the time to write we really appreciate it. We’re having a ball reliving all those great films and I’m glad we have covered a favourite of yours already! Burbs is out tonight (our time) Hope you enjoy it! Thanks to you too! Adore this movie. Chatted with Gidgit on twitter. So lovely to find out about this podcast and to listen to it. Well done! Feel like I’ve chatted with a celeb! Weird. Oh don’t use my name on twitter. Kelly Le Brock – ha ha ha! So funny. She WAS the most gorgeous woman in the 80’s – PLEASE do Weird Science! Hi Tommy, Weird Sceiene is a favourite for both of us, it’s definitely on the list!. Thanks for your support! Just heard about your podcast. I love this movie and – Kelly LeBrock! I’m starting from the start. After this consider me a new listener. You two so funny.